Don’t love the current UGA app? Do you only use the app to help you figure out where the bus is? Overwhelmed by the three pages of features that you have no idea what they are meant for? Don’t worry. We are here to help. We are revAPP. We revamp and refurbish apps pairing functionality with beautiful design. Our team is hired by failing websites and application developers to bring life back to their technologies by turning them into modern works of art that are beautiful and easy to use. Currently, we are partnering with the developers at the University of Georgia to redesign and relaunch their college application. The developers approached our team to help update their app, get rid of some of the clutter and create a more streamlined design in order to increase usability for their main users: students. 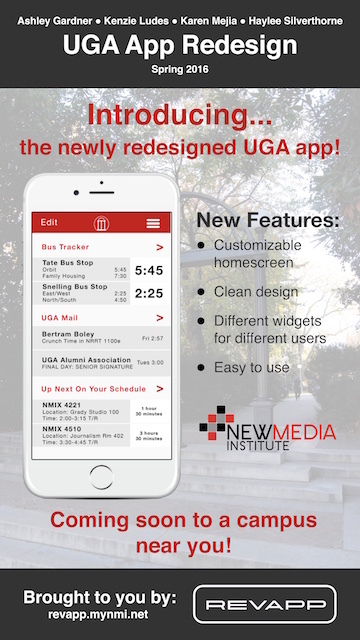 We have created a customizable homepage where users can have widgets for the varying needs of the UGA community. To redesign the UGA app, we are using Photoshop to create our mockups. These mockups are then put in Marvel to create a more realistic view of the app. The UGA developers plan to take our design, code it and release the newly designed app to the UGA community in the coming months following SLAM. We at revAPP hope that our redesign makes a positive impact on the UGA community. We want this app to be something that people want to use to get information in a condensed, quick format. As UGA students ourselves, we understand the frustration that users of this app face. We want to create an application that people want to use, one that is easy to understand and helps address every person’s needs — whether it be checking the bus route or figuring out a dining hall capacity. Because this is a locally based app, there will not necessarily be any global impact — unless other universities take our general designs and implement them into their own colleges. Through our time working with on the redesign of the UGA app and with the UGA developers, we have learned how to take constructive feedback and use it to our best advantage. Each little tweak brings us to the end result, and if we didn’t take feedback well, this process would not go as smoothly.